ManageEngine ADManager Plus offers a 100% web-based solution to meet the Active Directory management requirements. It allows creation and modification of multiple users, groups, contact in AD by hiding the complexities of the native Active Directory tools. Its role-based security model enables effective management of security permissions with ease. The comprehensive reports provide a quick insight of the Active Directory objects. The powerful search facility helps in determining the permissions granted for a specific Active Directory object. The search can be made on a specific AD object, for a specific user and on the permissions the user has. This helps in auditing on defined security permissions for a specific AD object or for a specific user. The Active Directory Explorer helps to browse through the Active directory for any of the domains. Administrators can view the properties and security permissions of the various AD objects of that domain. The user management module allows in creating multiple templates that contain the standard user attribute values, which can be used in creating bulk users. The user attributes can be imported from a csv file while creating user accounts, optimizing administrator’s time. Schedule Out-of-the-box reports, on Inactive Users/Computers, Disabled Users, Account Expired Users, Password Expired Users, Users in a specific Group, Users in multiple Groups, Locked Out Users, Security Groups, Distribution Groups, Users permission over Objects, NTFS and so on along with Compliance support. Generating custom reports for multiple domains is also possible. ADManager Plus allows to delegate roles to Help desk with ability to restrict them to specific groups. 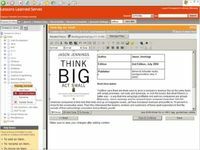 ADManager Plus is available in Free Standard and Professional Editions. 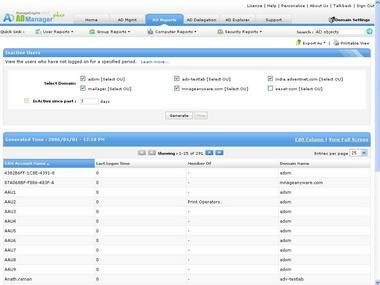 The free edition allows to manage and reports up to 100 objects in a single Domain.